In search of Sunday Lunch in Birmingham? I took my sons to try out the carvery at 1565 in the Park Regis Birmingham. Nothing beats a good Sunday roast dinner, but I don’t always feel like cooking one myself. So when Park Regis Birmingham invited me and my family to try out Sunday lunch carvery in their restaurant, I was all too happy to accept. My sons Ollie and Lyle accompanied me on this visit, as Mark was unfortunately busy that day. It was a beautiful sunny July afternoon when we visited the hotel, which is close to Birmingham City Centre. I was very happy that I wasn’t back at home cooking a roast dinner! The hotel layout is a little unusual, as you enter on the ground level and then go up in a lift to the hotel lobby. 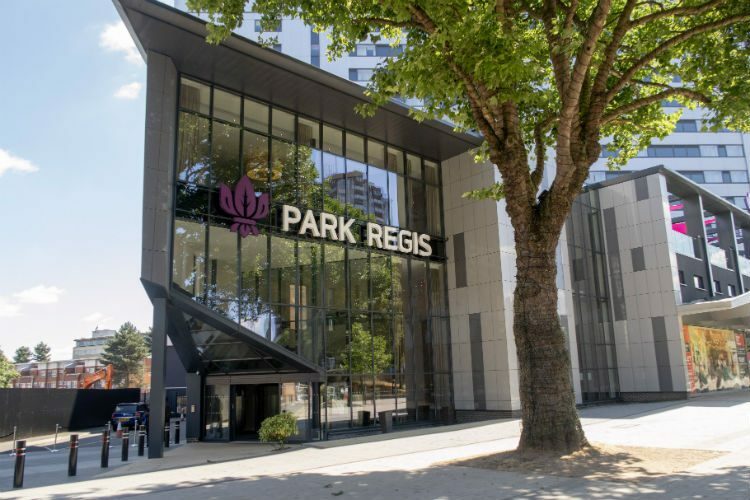 We were directed towards 1565, which is the Park Regis’ restaurant. After being outdoors in the nearly 30C heat, the beautifully cool air-conditioned surroundings of the restaurant made a welcome change! Inside, the elegant restaurant has a peaceful atmosphere. The bar is well stocked, and you can also take a drink outside to relax on the hotel’s terrace area. The restaurant manager showed us to our table, took our drinks order and explained how 1565’s carvery Sunday Lunch works. The carvery menu is available from 1pm on Sunday, with the last seating at 2.30pm. The £14.95 price includes three courses from the carvery, and you can ‘top-up’ if you want to order from a small selection of additional dishes on the menu. Our drinks soon arrived at our table and we set off to fetch our first course. There was also a tureen of steaming hot soup for you to serve yourself from, and warm bread rolls with butter. Lyle and I headed for the salad bar, and both enjoyed building our own salads. The potato salad was particularly tasty and the lettuce was lovely and crisp, not a soggy leaf in sight. The chunky slices of tomato were ripe and juicy, and the salad made a pleasant start to the meal. Meanwhile, Ollie had decided to try the soup – he’s not a big fan of salad. He really liked the enjoyed vegetable soup, and warm crusty bread rolls always go down well. Of course, one of the benefits of a carvery is that you can head up for your main course as soon as you are ready. The main event of Sunday lunch is always the roast joints of meat, and 1565 is no exception. You can choose from roast beef and turkey, plus a roast of the day and a vegetarian option. The roast of the day when we visited was roast gammon. I didn’t see the vegetarian option so I’m not sure if it was brought out later. In addition to this, you can help yourself to Yorkshire puddings, pigs in blankets and a vegetarian stuffing. There’s also a selection of vegetables, roast parsnips and carrots, steamed new potatoes and roast potatoes. And gravy and a selection of sauces, of course. Phew! We loaded up our plates and headed back to the table, which the waiting staff had cleared while we were away. I picked the roast beef, which was was beautifully pink and very tender, just the way I like it. Normally I won’t order roast beef when I have Sunday lunch at a restaurant, because it’s often over-cooked. And I was really impressed that the veg wan’t overcooked and soggy. The mixed greens included leeks, cabbage and mangetout, and I really enjoyed the sweet roast carrots. Lyle’s plate looked pretty similar to mine, but Ollie had gone for his favourite – roast gammon. He let me have a small taste of it, and it was deliciously tender, juicy and not overly-salted. Ollie really enjoyed it, and also liked the cauliflower and broccoli. I’d skipped that option as I only like them very lightly steamed, which is difficult to do in a carvery set-up. We all enjoyed our roast dinners, and before long our plates were clear. The only disappointment was the Yorkshire puddings. These were very heavy and doughy, not at all the way that a Yorkshire pudding should be. I have had very good Yorkshire pud on a carvery lunch before, so I know it can be done. I really hope the Park Regis work that kink out of what was otherwise a good roast dinner. The waiting staff came to check on us regularly throughout our meal, and cleared away plates and glasses when we were ready. Our drinks arrived promptly and the service was as generally good as if we had been ordering from the menu. When the time came for pudding, menus appeared at our table for us to choose from. You don’t serve yourself for this course. Ollie had picked the chocolate orange mousse, which you can see in the photo above. He let me have a little taste for myself, and it was delicious. The sharpness of the orange jelly at the bottom contrasted nicely against the creaminess of the chocolate mousse. I picked the gateau of the day, which was Black Forest Gateau. Unfortunately, I have to say it was quite underwhelming. It was fridge cold, and had none of the squidgy richness that I associate with this kind of cake. But from the look of bliss on Lyle’s face as he dug into the profiteroles that he ordered, those were anything but underwhelming. I didn’t try to steal one, as tempting as it was. But I did dip a little finger in the chocolate sauce, and that tasted really good! In my experience, a carvery-style Sunday Lunch can be a bit hit or miss. A good one will be a quick and convenient way to get together with family or friends for a traditional roast dinner. But all too often, the food suffers for being kept warm for too long. Meat ends up dried out, and vegetables become soggy or overcooked. And the carvery that we enjoyed at 1565 wasn’t a perfect meal. The Yorkshire puddings and the Black Forest gateau were definitely below par. I really hope that they sort out the issues with the Yorkshire puds, they’re too important to get so wrong! But there was a lot that was good about our Sunday Lunch at the Park Regis. The salad starter was fresh and appealing, the meats were cooked perfectly, and there was an excellent choice of sides. And two out of three of our puddings were delicious. And that’s all set against the elegant surroundings of the 1565 restaurant itself, and the attentive service that we received during our visit. Our meal was complimentary, but the total bill would have come to a little over £60. That includes the three-course carvery meal for three people, one medium glass of wine, three Cokes and a bottle of mineral water for the table. I think that represents decent value, and I would definitely consider bringing my family to 1565 for a carvery meal in the future. Thank you to Park Regis Birmingham for a lovely family Sunday Lunch!